I heard a Veery on Sunday. That may not sound like a big deal, but it’s the first one I’ve heard locally in more than five years. And hearing them is often all you do, for these brown thrushes are somewhat secretive and stick to woodlands where they can be hard to spot. However, their song is one of the most distinctive and easy to recognize of any of our migrants. It’s a flutelike cascade of notes, seeming to echo as if they were sung through a long open pipe. Once you’ve heard the song, you never forget it. 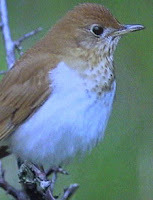 Time was when the song of the Veery was a sure sign that spring had settled in. It was something to listen for. But Veeries are in what the Cornell Lab of Ornithology calls a “slow decline” throughout their range. In winter, that range includes a large area of central and northern South America, much of it rain forest, which, as we all know by now, is being cut down. Ornithologists suspect that this “rapid habitat conversion” is reducing the Veery population. Veeries have also suffered from nest parasitism by Brown-headed Cowbirds, but the latest studies on cowbirds are finding that these birds may also in decline. So it’s likely that the habitat destruction, in both winter and summer ranges, have been affecting the Veery numbers in our neighborhood.